The warning came as MPs were set to vote on a proposal which would effectively hand backbenchers the power to tell the government what form of Brexit to pursue. 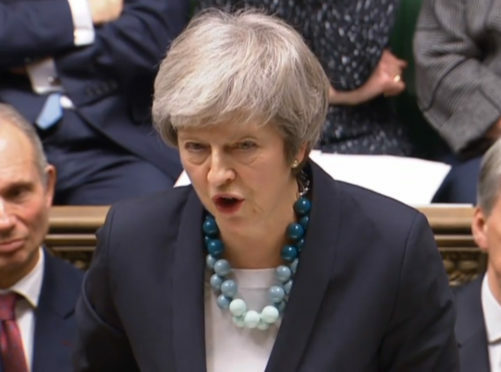 The prime minister, while conceding there was still not enough support for her deal and acknowledging Parliament’s rejection of no-deal, said she could not support the move which would allow MPs to take control of the parliamentary timetable and carry out a process of “indicative votes”. Mrs May, speaking in the Commons, said: “I must confess that I am sceptical about such a process of indicative votes. Mrs May, in anticipation of what options would be tabled by MPs if they were to get control, said it could result in a “slow Brexit”. She said: “We must confront the reality of the hard choices before us. Unless this House agrees to it, no-deal will not happen. No Brexit must not happen. SNP Westminster leader Ian Blackford said voters were “ashamed” of Parliament, the UK Government and the “embarrassment that British politics has become”. He asked Mrs May to reject a no-deal Brexit, adding: “What is the point of all of us sitting in this chamber and voting on debates when the Prime Minister thinks she can ignore parliamentary sovereignty? “What a disgrace – because if our votes don’t count, then, frankly, we may as well just go home. As Mrs May referred to the 2014 Scottish independence referendum, Mr Blackford shouted “give it a rest”.